Grover Beach Police arrested a Pismo Beach man for selling marijuana out of an illegal mobile marijuana dispensary on Sept. 12. At approximately 3:20 p.m., someone reported a man was selling marijuana out of a van on the 100 block of North Second Street. 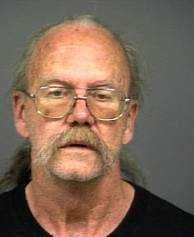 Police discovered Robert Wharton, 58, was operating a mobile marijuana dispensary in violation of state law. Officers seized 58 grams of marijuana and $5,500 in cash out of Wharton’s van. Officers booked Wharton into County Jail on two felony charges: possession of marijuana for sale and illegal transportation of marijuana. Warning! People of Morro Bay, this is your new pharmacist. I’m thinking maybe it was the “Up in Smoke” weed van that gave him away. To operate a collective one is required to be a 403b Non Profit Organization. As a legally operating collective, it is within the framework of the organization to transport medical marijuana to patients holding valid medical marijuana recommendations. I am gonna file this in my “WHAT on earth was he thinking??! !” file. A head shaker.